I promise to use it only to send you "Colours of the Month". Violet, or Purple, is the color of royalty, and for this reason and the fact that Daniela loves and collects them, this section features the Noble Pig. Here you can read about all types of pig breeds, learn all about having a Pot-Bellied pig for a pet, and visit our Pigs Hall of Fame to see how many of these famous and cute pigs you know! We are constantly updating our pages and adding new content. Please subscribe to our RSS and/or our monthly newsletter and e-zine "Colours-of-the-Month" to recieve constant updates. Our newsletter contains updates to our website plus regular features only available to our subscribers like special recipes of the month, discounts for music downloads, links to online movies and movie reviews, special travel reviews and tips on airfare specials and lots more! On this page I outline some of the more popular breeds of pig as well as a few that are rare and almost extinct. Pot bellied Pigs are all the rages as pets, but before getting one, auaint yourself with what is actually involve in being a Pot Belly parent! Pot Bellied Pigs - Should I get One? If you already have a pet or pets and /or children, you should definitely read this before bringing a piggie home! Potbellied Pigs, Children and other pets. How they get along. Since their domestication by man, many famous pigs have risen to the fore . 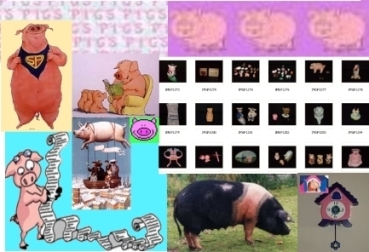 We've put together what we consider the most comprehensive collection of celebrity pigs found in any one place, both animated and real. Famous Pigs Hall of Fame! We've recently added Danny's Pig Collection to Our Pages!